Whether you are a college football player, a high school superstar or a weekend warrior, or if you aren’t even an athlete at all, The Orthopaedic Center (TOC) has a specialized approach to your injury and recovery. We are a team of specialists dedicated to the complete care of sports-related injuries, offering a comprehensive program of prevention, treatment and rehabilitation. We’ll get you back in the game. Our expert staff includes surgeons, physical therapists, education coordinators, athletic trainers, nutritionists, and exercise physiologists, all specially trained in sports medicine. They work together to map out the most appropriate strategy for diagnosis, treatment, surgery and rehabilitation. Give us a call at (256) 539-2728 and we’ll discuss an injury prevention program for your team. To prevent injuries before they happen, TOC physicians team up with certified athletic trainers to perform preseason athletic physicals. Individuals are welcomed; a special effort can be made to schedule team appointments. A revolutionary, minimally invasive diagnostic device used to provide real-time analysis, faster treatment and effective outcomes. Learn more about mi-eye 2. What do you do if you are injured in the middle of a game? TOC offers Friday night post-game injury clinics during major athletic seasons. High school, college and professional athletes are treated by TOC physicians and athletic trainers specializing in sports injuries. Insurance is accepted and no appointment is necessary. The training of an orthopaedic surgeon involves many years of undergraduate, medical school, and residency education. The specialization of sports medicine involves additional training, usually at an educational center where a fellowship year is completed. This involves advanced training in arthroscopic surgery, required in the treatment of most knee, shoulder, ankle, elbow and sports medicine-related injuries. The sports medicine-trained surgeon also has knowledge of a specific rehabilitation and muscle performance issues to safely regain function and return patients to athletics or other occupation more quickly. 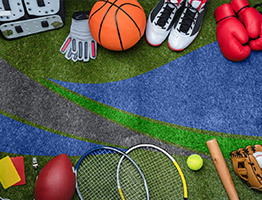 A sports medicine center combines the disciplines of physicians, physical therapists, athletic trainers, and more to totally heal all aspects of an injury.